What do FedEx, AirBnB, and Evernote have in common? We can all agree they are hugely successful companies. They’re also companies from which most of us benefit on a regular basis. Interestingly, all three also were once startups on the verge of collapse when they were saved by investors who cared enough to lend a hand. So when I heard one of my favorite specialty cheesemakers, Landmark Creamery, needed a hand, I immediately donated to Go Fund Me and I then went shopping for three of its cheeses. Landmark Creamery is a labor of love for Anna Landmark and Anna Thomas Bates. Since 2014, “the Anna’s,” as they’re known, have been churning, and rubbing, and aging small batches of cheese made from local, small, family-owned dairy farms. You can find their products online, and at Madison area specialty stores, co-ops and restaurants. Two years ago they opened their own retail shop in the quaint village of Paoli, where they sell not only their own cheeses but also those of other Wisconsin cheesemakers. Coincidentally, in the next few weeks you can find them featured on PBS’s Wisconsin Foodie. So, it seems Landmark Creamery has recently found itself in a bit of a bind. According to the Go Fund Me page, the ladies lost over 1,000 pounds of cheese after their cold storage company threw it out. The Anna’s had fallen behind on payments and owed the company $1,000. According to the page, they told the company owner they would pay as soon as possible, but the owner declared the space abandoned and threw away the cheese. The cheese, valued at $20,000, is a hand-crafted product needing six months to age, so it’s not easily replaced. As a small business owner, I understand the importance of being paid. The storage facility provided a necessary service to Landmark Creamery and it was right to expect the agreed-upon compensation. You bet I’m all about responsibilities and holding up one’s end of the bargain. But I also remember those startup days, struggling to succeed and stretching money to pay the bills. I appreciate all the help I received back then (my husband’s support was and still is a necessary component to me staying in business). I firmly believe when we uphold one another, we all stand stronger; that supportive action today generates positive reactions tomorrow. Kudos to the Culinary Ladies Collective for setting up the Go Fund Me for Landmark Creamery. This network of female chefs, food and beverage producers, growers and artisans is an example of how we go far when we go together. I’m also a believer in communication. In Adunate’s 14-year running, I’ve only had a few clients fail to pay me on a timely basis. Those who respected me enough to talk to me about it are still my clients today. Those who ghosted me, well, you can bet I now refuse to work with them. According to the Go Fund Me page, Landmark Creamery had just made a payment on the balance and had communicated with the storage facility they would pay the rest as soon as possible. If this was the case, I just can’t see how destroying $20,000 of product for a $1,000 bill was beneficial to anyone, including the owner of the storage facility. 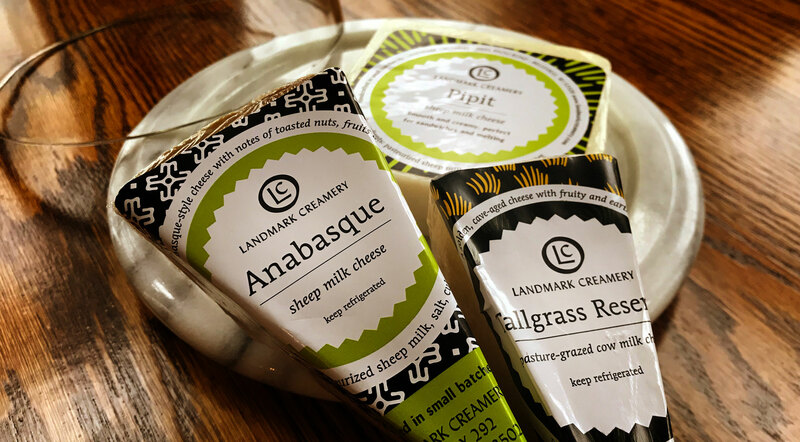 Folks, if you’re a fan of small businesses and local foods, if you love Wisconsin specialty cheese, if you have a minute and a few extra dollars, please consider supporting Landmark Creamery. You may very well be benefiting more people than you know, not to mention keeping some fantastic cheese in production!